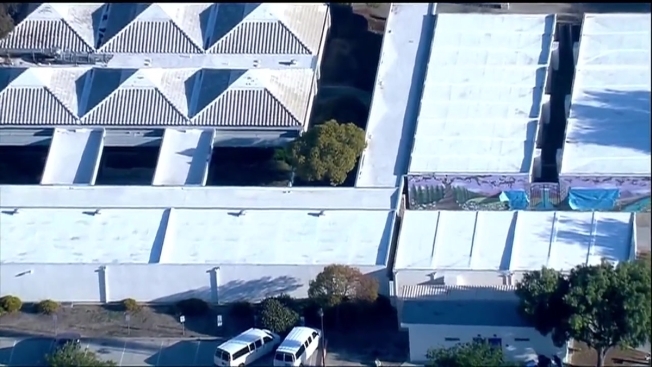 Surveillance footage may lead school officials to find out who left messages threatening violence and referring to the recent deadly shooting in Florida at Rancho Bernardo High School. San Diego police responded at approximately 7 a.m. to investigate the tagging of various buildings on campus. Staff at the school used paper to cover up the messages. Some of the messages referred to the deadly shooting at Marjory Stoneman Douglas High School. The Feb. 14 shooting at the school in Parkland, Florida killed 17 people and injured 14 others. Rancho Bernardo HS Principal Dave LeMaster sent a message to parents and students informing them of the threatening messages painted throughout the campus. "We immediately contacted San Diego Police Department who are on campus investigating. At this point, the SDPD do not believe this to be a credible threat," LeMaster said. "We will continue to have police presence on campus for the remainder of the day and throughout the week." LeMaster said after seeing the vandalism, many students opted to leave campus before first period. Keziah Bulatao was walking on campus when she noticed the graffiti. “It said ‘Florida was nothing,’” the RBHS junior said. Her father rushed back to the school to pick her up. Even though she felt better going home than staying, she said she was upset about the time wasted because she had plans to finish up a project with classmates. “I would rather be safe. Knowing that there was a school shooting recently, it’s best that we go home,” Bulatao said. Indresh Chaudhari has a daughter at the high school and could not believe what was happening. “They don’t understand how difficult it is for the family, for the parents,” he said. Ann Fleming has a student who is a freshman at the school. She said she was upset about the news of the messages but didn't find it surprising. "This seems to be the America we’re in," Fleming said. “Making a decision between your kids getting an education or essentially potentially staying alive is a strange place to be in,” she said, adding that she's grateful the school district takes these things seriously. San Diego police officers were reviewing security footage, Poway Unified School District Superintendent Marian Kim-Phelps, Ed.D. said. "Perpetrators will face felony charges," she said. "We want everyone to be aware of the serious consequences of this type of crime," the superintendent said. "These threats terrorize communities and frighten parents, students, and staff and severely disrupt the school day. Our schools should remain places where our students feel safe enough to learn and grow." There are 2,400 students enrolled in the school from the communities of Poway, Rancho Bernardo, Los Penasquitos, Sabre Springs and Carmel Mountain Ranch.